Elizabeth Hardwick, known as Bess of Hardwick and a native of Derbyshire, became the second most powerful and wealthy woman of her age in England, the first being Queen Elizabeth the 1st. She amassed her great wealth, land and stately homes mainly through her 4 marriages. She was first married as a child but her husband died young. In 1547 she married Sir William Cavendish, of the Cavendish family from Suffolk, and it was from their second son that the present line of the Dukes of Devonshire descend. He was made Earl of Devonshire in 1618. It is not until 1694 that the 4th Earl was created the 1st Duke of Devonshire and Marquis of Hartington. In 1549 Bess and Sir William bought the land on which Chatsworth now stands and in 1552 started building the Chatsworth House. It was later rebuilt by the 4th earl, Bess's great great grandson. In 1567 Bess married George Talbot, Earl of Shrewsbury and one of the most powerful men in the Kingdom. He was appointed by Elizabeth 1st as warden to Mary Queen of Scots who was frequently kept at Chatsworth under his guard. 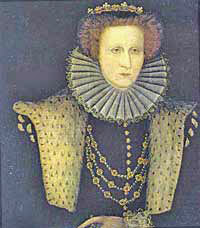 In 1590, Shrewsbury died leaving Bess the second richest woman in the land. Ambitous to the end, she married off one of her daughters to Charles Stuart, brother of the late husband of Mary Queen of Scots, who had both Royal Tudor and Stuart blood in his viens. Their daughter Arbelle Stuart was in direct line for the throne of England, being the closest female relation to Queen Elizabeth. Bess built the new Hardwick Hall next to the old one, to be a fitting home for a future queen of England. However Elizabeth chose Arbelle's cousin James VI of Scotland to suceed her. Bess is buried in Derby Cathedral.